The exotic sound of Indian music from a tape which gave us our Indian friends as well as the many beautiful photos and videos we took in India, recall the flair of the orient and convey a vivid picture of all the fascinating and conflicting impressions we had on our trip. Omnipresent and unforgettable are the pictures of the magnificent Mogul- and Maharaja palaces, mosques, temples and forts from white marble, red sandstone and other refined material with most elaborate stonemason works and inlays of semiprecious stone and one feels, nothing will ever surpass the beauty of this amazing cultural heritage. 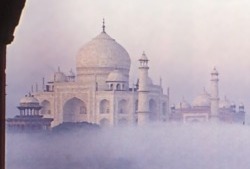 Above all the legendary Taj Mahal is an overwhelming sight and exceeds all you ever can imagine. It's fascination arises from the awareness, that it is a creation of love just as from its beauty, which lies in the boldness of its inception, the faultless architecture, the magnificence of the structure and the sense of proportion in all its components. The layout is superb, the setting on the banks of river Jamuna, amidst beautiful lawns and gardens, and the construction in pure white marble are incomparable. 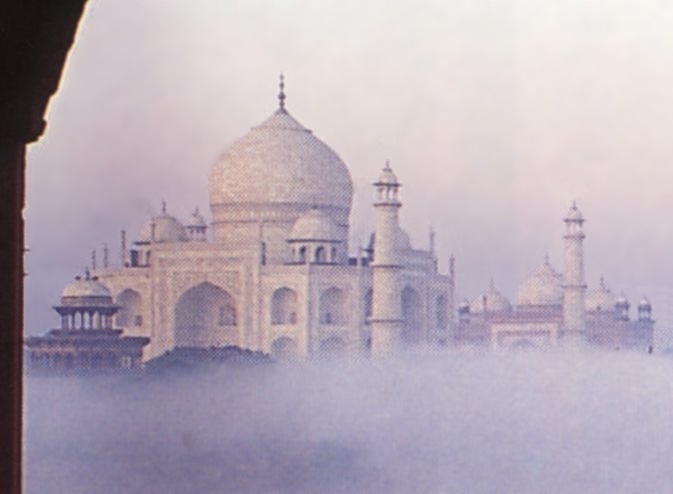 The Taj is as beautiful during daytime as it is in the moon light. 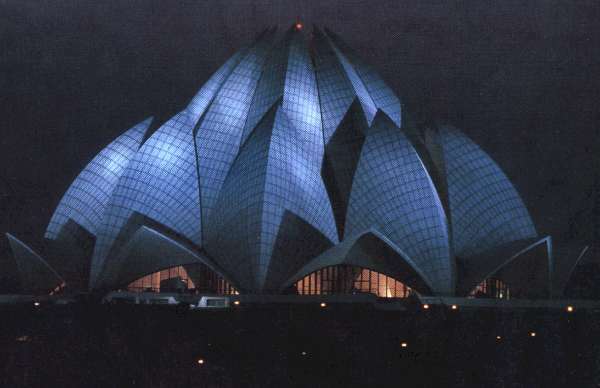 It is indeed the most magnificent monument and memorial of love which mankind ever has seen! The marvelous Mogul- and Maharaja palaces, mosques and temples are the one side and the real reason to visit India, however the real life presents a very different picture from what the normal European ever can imagine. Inseparable from the magnificent cultural treasures through our minds and dreams go the pictures of the unbelievable and unimaginable poverty of so many people right around us everywhere and all day long. All our lives we'll never forget those terrible sights. It is a very different thing to watch the misery on TV than to experience it in person. We did not know what it means to be faced with living conditions of the so-called "third world". Beggars, misery and bitter poverty wherever you go. We gave alms to handicapped people and pleased children with sweets, balloons and bananas ... however of course the single people can't help it. There is a very wide diversity of economic status and education in Indian society. Just recall, that about 50% of the Indian people are illiterates while Indian computer scientists are appreciated specialists in the sophisticated Western countries! 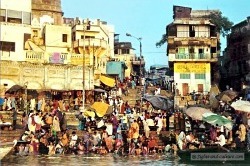 By the side of palatial residences one can see the crowded slums where people live in sub human conditions. 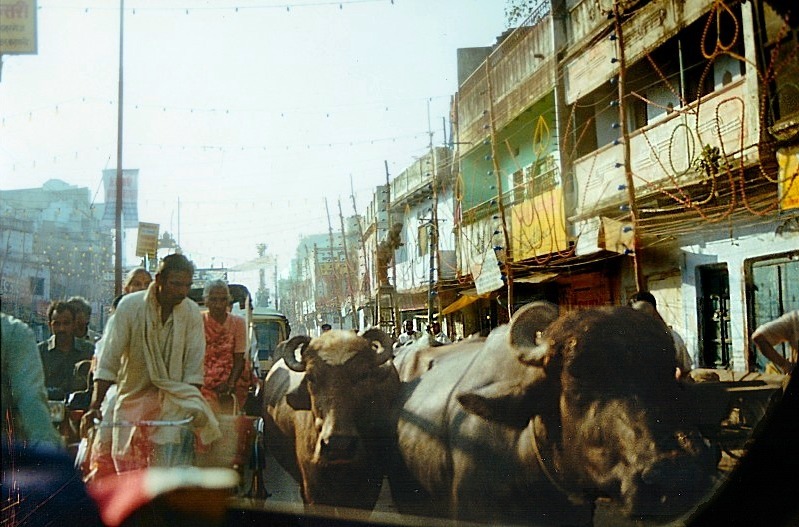 In the cities imported cars move side by side with rickshaws. Like in economic conditions there is also a very wide variety in customs, languages and religions in this amazing country. So despite the great diversity India is one Nation with an amazing potential. However it will take a long time and need more international support to create dignified living conditions for all people in this vast country. In India religion is way of life. It is an integral part of the entire Indian culture and permeates every aspect of life. Hinduism is the dominant faith, practiced by over 80% of the population. But India is a secular state. People of many religions freely live here. Hindu Religion is the most peaceful religion I know. That's why Hinduism can be passed only by birth and thus there are no missionaries who try to convert people to this religion. Hindu religious thought is based on the "Vedas". In fact the name of the religion truly is "Vaidic" religion and not "Hindu" religion. The name Hindu came to be attached because the people practicing it were living on the banks of river Sindhu then. The "Vedas" were written down in Sanskrit about 3000 years ago and give a detailed description of customs and belief of the "Aryas" who settled India in those days. They are considered to be one of the earliest literary works of mankind. For Hinduism the "Vedas" are the scriptures incorporating the science of living as revealed to the sages in the state of deep meditation . The Hindu believes, that each being has an immortal soul, which will migrate to another body after death. Rebirth (reincarnation) can happen in form of any creature. That's why faithful Hindus are strict vegetarians. The Hindu understands his present state - sickness and misery as well as health and prosperity - as a deserved consequence of the good or bad deeds in his previous life. Thus he would not envy someone his fortune or complain about his bad luck . A handicapped Hindu said: "I don't know what I have done in my previous life but I have to suffer for it now". This philosophy of Karma should encourage him to be virtuous. 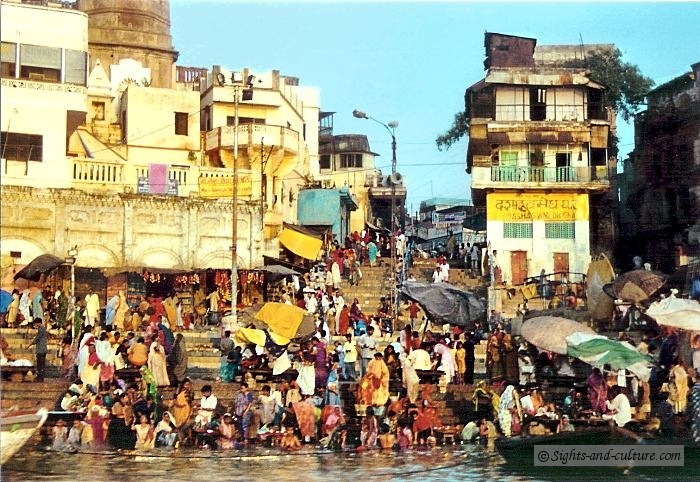 The visit with our Indian friend and our observations in the different temples and especially at the banks of the Ganges in Varanasi (Benares) gave us deep insides in the spiritual world of Hinduism and lead us to a better understanding of this belief. It is unimaginable how strongly Hinduism determines people's life with all the rites as for example daily worshipping different deities at the domestic altar. The domestic altar is a "must" in each home but as well in public establishments like shops, restaurants etc. Such an altar mostly consists of a board on which are placed small statues of the different deities, decorated with flowers, an oil lamp and religious pictures. 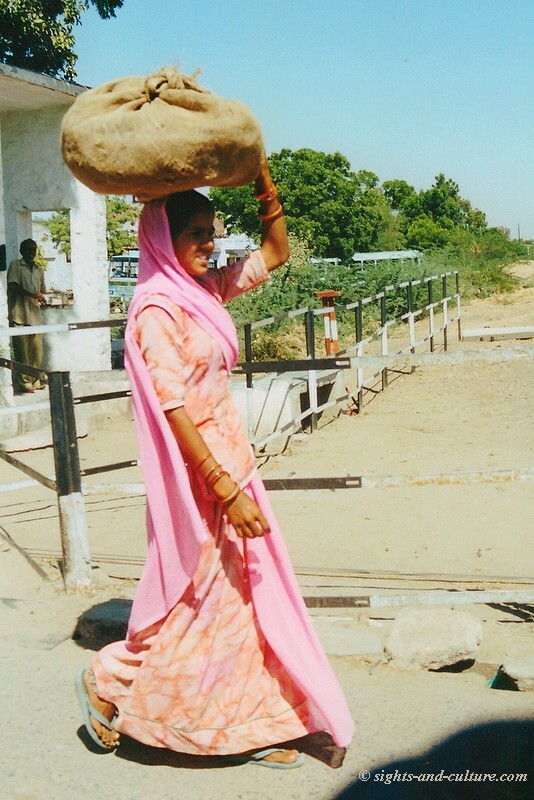 Most impressive and charming is the colorful traditional clothing of all the women, especially in the country Rajasthan. 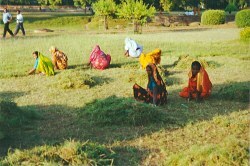 They wear their saris each day, even while working in the field (see chapter "experiences in the country" and related site). 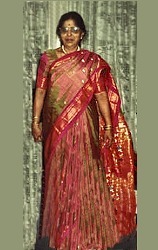 The sari is a 6 m long and 2 m broad scarf and sure it demands some skill to dress oneself with it. It is available in different materials (cotton, synthetic, silk...) accordingly to the intended purpose. 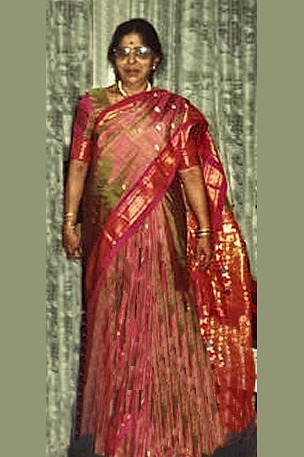 For festive occasions there are precious, elaborate, handmade saris from pure. finest silk with golden threads in marvelous designs. The Indian women have an amazing sense for tasteful clothing and pay attention that all the accessories like bangles and the point on the forehead match in color with the sari. The festive saris are incredible beautiful and the women make a charming sight! Such valuable handmade pieces are very expensive in relation to an average income in India. However men spend much money to dress their wives and sisters accordingly to their social position. 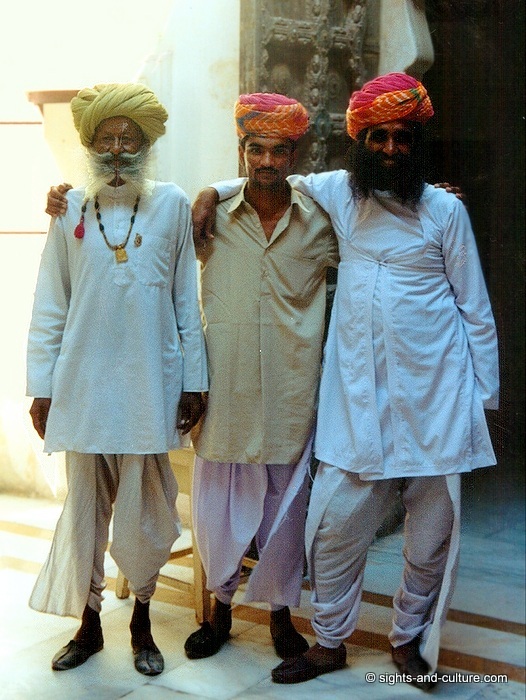 The traditional clothing of men consists of long wide shirts and trousers from different materials, beginning with simple cotton up to fine pure silk, according to the occasion. In Rajasthan some men by tradition wear a great looking twisted mustache and sometimes a turban. However, men dressed like on the picture are seldom. 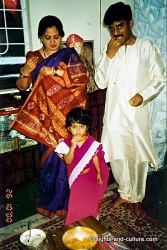 To see a festive dressed family see picture under the chapter "Diwali". If you ever go to India you should do it around Dusherba/Diwali in October. We had the unique fortune to share Diwali with our Indian friends and owe to them the happiest days of our trip as well as unforgettable beautiful experiences. Diwali is the festival of lights, celebrated all overIndia, to commemorate the victory of Lord Rama over demon King Ravana. The festival denotes, that truth always triumphes over the evil. This is the happiest festival of Hindu calendar. At night countless oil lamps light Rama the way home from his period of exile. 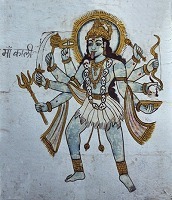 Today the festival is also dedicated to Lakshmi and to Kali in Calcutta. 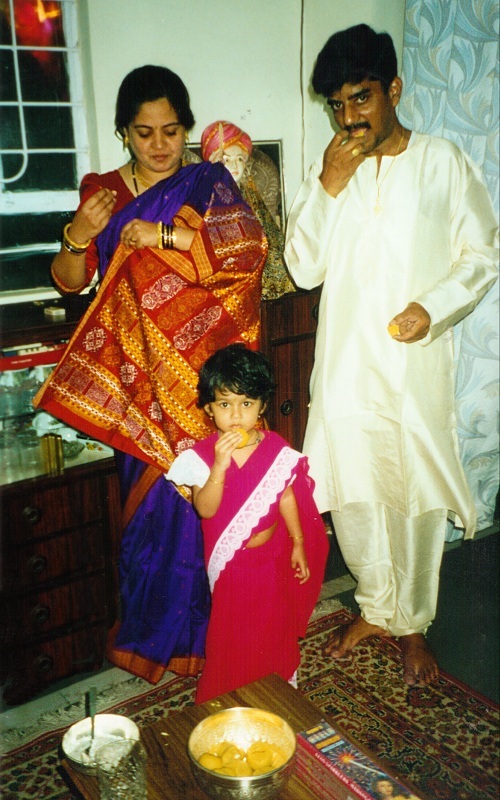 The picture shows the family of our friend's son on Diwali in festive traditional clothing eating sweets. All in all the festival lasts for five days. On the first day The houses are thoroughly cleaned and the door steps are decorated with intricate rangolis [chalk design]. Day two is dedicated to Krishna's victory over Narakasur, a legendary tyrant, in South India on this day, a pre dawn bath is followed by donning of new clothes. By custom you have to take a pre dawn bath because it is said, that angels, Gods etc. roam on earth in the pre sunrise time. Day three is spent in worshipping goddess Lakhsmi, the goddess of fortune. Traditionally this is the beginning of new financial year for the companies. Day four commemorates the visit of the friendly demon bali whom Lord Vishnu put in his place. On day five men visit their sisters to have a tika put on their head (tika is an application of red vermilion on the forehead. Hindus apply it). Exchanging sweets has become a part of tradition as well as lighting of oil lamps. Diwali marks also the beginning of the New Year in North India, which is welcomed with crackers and street fireworks like everywhere in the world. Actual the travel agent and my Indian pen pals warned against the long rides by car through the country - they would be too stressing and tiring but they were next to the sights and the place of pilgrimage, Varanasi (Benares), the most interesting and informative part of this trip. They gave us unique experiences and unforgettable impressions of Indian life, living conditions and culture. The Indian traffic is the most incredible experience you can have as a European road user. No matter if you are in an old city or ride through the country you share the road with camel carts, hand pulled fruit carts, thousands of bicycles, hundreds of rikshas as well as with free living pigs, cows, dogs and sheep. In this way the speed limits itself in the towns of 10-15 km/h and on the roads outside of about 45 km/h..... 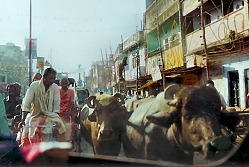 The picture shows a view from the rear window of our car of the traffic in Varanasi. 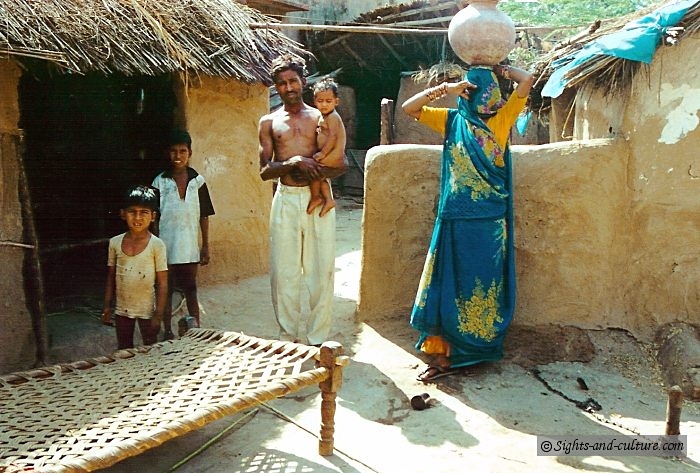 A motorbike is used for as many as 4 people as we watched and so it goes for example for a family: behind the driver (father) a child and at the end of the seat sitting across the mother, dressed with her sari holding a child on her lap. Except for the younger districts of the big cities we didn't see any traffic signs like for right of way. The cars as a whole have no outside rear-view mirror and usually one does not use blinkers. There is only one simple rule: you have to watch the traffic in front and to show with your hand if you want to turn off to another direction - the drivers behind you will realize this and be careful... The most important part of the car is the horn - how else could the driver in front know, that you intend to pass and how else could you push him or get him to make way for you? On our long way through the country by plain, train and more than 1000 km by car, we contacted many people and found them very friendly, no matter where we stayed. English is understood almost everywhere and especially the children and youngsters liked a small talk. Mainly they wanted to know, where we came from and if we liked India and were happy to get a confirmation. The villages are usually cleaner than the old districts of the cities and we were pleasantly surprised to see, that people in the country were amazingly well dressed. With their colorful traditional clothing the woman decorate like flowers the countryside (see chapter "traditional clothing"). The picture shows girls and woman cutting the lawn in the temple garden of Sarnath (near Varanasi). It is the very normal way to do this work - no lawn mower! It gives them the chance to earn some Rupies. 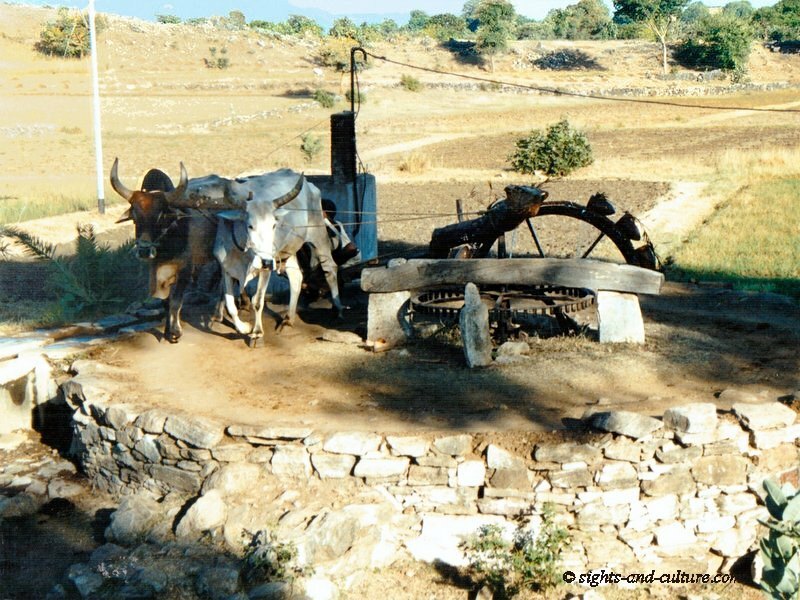 Most interesting for us was a stop at the "Persian wheel", an irrigation system which is famous in north India. At the wheel is fixed a long chain with cans, which scoop the water out of the well into a duct . It works with ox power. A special social feature in Hinduism is the classification of people through a system of castes, which was already described about 3000 years ago in the "Vedas" (see chapter about Hinduism). Basically the castes were assigned accordingly to one's occupation. Through passage of time however, the affiliation to a caste began to be irrevocably decided by one's birth. 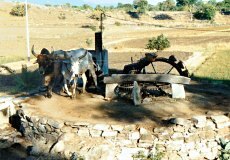 The castes as an elementary part of Hindu social structure control the living together among people and in this way their entire lives. 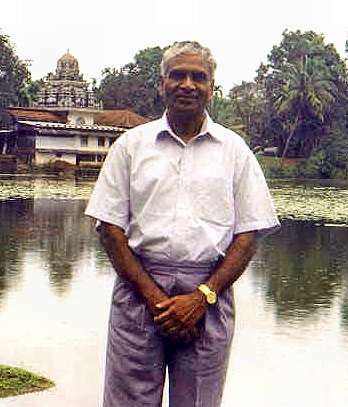 Hindu priests don't preach in the temples like one knows it from Christian churches but have to enlighten the fellow beings and perform religious functions. They are considered the Gurus or teachers and are respected by all. Brahmins do not aim at riches. Theirs is a life of simplicity ,reflecting the principles of Hindu religion. Warriors are the nobility. They are supposed to protect the subjects from enemies and to administer the state. Amongst these castes there are many sub castes, based on more finer division of the duties. Thus in the servants caste, those who did the dirty work came to be "untouchables" though the religion does not deprecate them only because of their low occupation. They don't belong to any caste and form the lowest stratum of the society. In the past they were absolutely without rights and had to suffer the hardest fate. Many social workers fought for their justice including Mahatma Gandhi, who called them "children of God" and tried to integrate them into the society. However only under the reign of Nehru the discrimination was abrogated by law, but this has not necessarily changed the traditional opinion among the people and thus most of them live under sub human conditions. In the Modern society the social system has undergone considerable changes and the name of the caste not in the least has anything to do with the professional development of the people. Thus our driver and the rickshaw driver proudly pointed out to us, that they would belong to the caste of the warriors, which is to make out by the word "singh" as a part of their name. Even if the castes were officially abolished by the Indian republic many years ago they form the Indian society still today, at least on the personal side. Sure this system will survive still some further generations as for the Hindu it is a question of the ritual purity and now as ever parents choose for their marriageable children a partner only within their caste (see chapter Indian wedding).